Neonfiller.com favourite Emmy The Great (pictured) and one of our top ten bands to watch out for in 2012 Kill It Kid are among a raft of additions to the Truck Festival line up. Taking place in Oxfordshire on July 20th and 21st the festival is now in its 15th year and will be headlined by The Temper Trap and Mystery Jets. Also added to the bill is Bombay Bicycle Club collaborator Lucy Rose, Oxfordshire act This Town Needs Guns and The Magic Numbers bassist Michele Stodart, who is releasing her debut solo album this year. Others added are Josh Kumra and ‘orchestral country pop’ act Gabriel Minnikin & The Fast Country. Tickets including camping at the Hill Farm, Steventon, event cost £69. 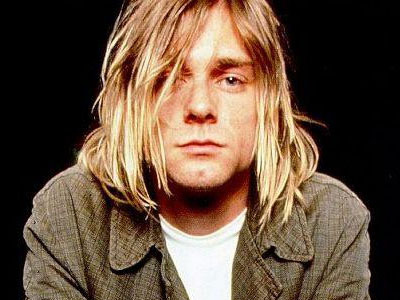 The firm behind the Tupac hologram that appeared at this year’s Coachella Festival, has revealed it is considering bringing Kurt Cobain, Elvis Presley and Michael Jackson back to the stage as well. Among other dead rock stars the firm would like to create holograms of are Jimi Hendrix and Whitney Houston. The hologram of Tupac, who was killed in 1996, appeared at this year’s Coachella festival including a performance of ‘2 Americaz Most Wanted’ as a duet with Snoop Dogg. St Gregory Orange were one of our standout acts that appeared on Wakefield based label Philophobia Music’s 2010 compilation Under the Bus Station Clock. Their interesting, sombre track on this compilation, Pan Away And Fade To Black, was enough for us to name them one of our top ten bands to watch out for in 2011. Thing is, as with another on that list, Django Django, we were a year too early. It has taken them a while to come up with their second album but as the saying goes, it has been worth the wait. Turns out there’s far more to the band than a spot of synth sound scaping that typified Pan Away And Fade To Black and which starts Chalklines, the opening track of Midnight At The Sycamore Lounge. As Chalklines progresses the soundscape passes and the abstract lyrics come in the album quickly turns to some kind of northern English, Flaming Lips, Pavement, Pulp hybrid. It’s not a great opening, a little unnerving in places, especially the bit about “starting drinking in the afternoon” but you get the sense that is maybe the point. Their world is not meant to be easy going. There’s a lot of drinking going on, not nice drinking instead a kind of unpleasant, weary drinking to forget type drinking. The sparkle of this album though is its ability to create their own universe, even if it’s a bit of a crap one, set in the wee small hours, possibly on a park bench in a Northern town, watching the dawn break as two blokes relive the horrors and joys of a Saturday night out. 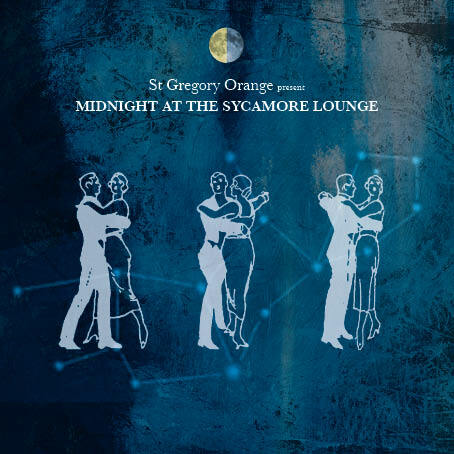 It’s not until the well worked string and acoustic guitars of third track Salem AM that the album and the night out with the St Gregory Orangers really gets going, part Streets, part Malkmus this album oozes slacker pop with intelligence. My Exile Years get s a little more Flaming Lips as it “sleep walks through my waking life with a bottle in my teeth” and the St Gregory lads struggle again to remember a night out, possibly while clutching a can of Red Bull. Somnambulist Atlas and the backing vocals on No Tragedies are other highlights on an album that is at times difficult, frequently clever and above all different. I guess spending the early hours in Wakefield with The Flaming Lips, Pavement and two blokes carrying synths trying to remember the events of only a few hours ago was never going to be an average night out. Midnight At The Sycamore Lounge is released by Philophobia Music on May 28. For more information click here. 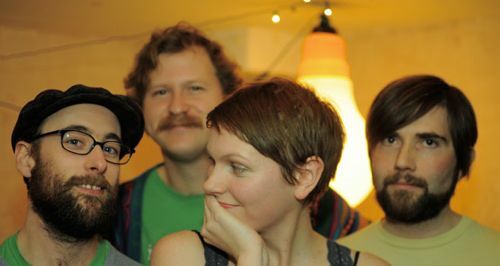 Just discovered this act, Fighting Kites, who release their music on Variant Records. lovely stuff for fans of the quieter side of (deep breath) Instrumental-Post-Rock-Noise-Pop. Tomorrow is Record Store, a celebration of music and all the things that make record stores such an integral place in the music industry. The widespread move to MP3s and online consumption models has made a big impact on the industry and seen many shops close over the last few years, but many independent retailers have hung on and maintained a large loyal customer base that enjoys the tangible elements of music consumption. Record Store day is in its 4th year and as usual a huge quantity of exclusive and limited records is available for those prepared to get up early and join the inevitable queues. 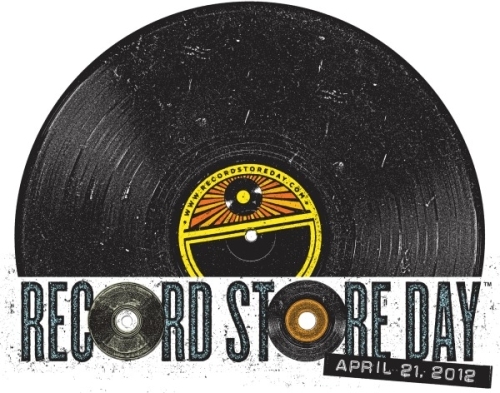 You can visit the Record Store day website for a full list of titles on release and there is something to appeal to most musical tastes with vinyl being the primary format on offer. 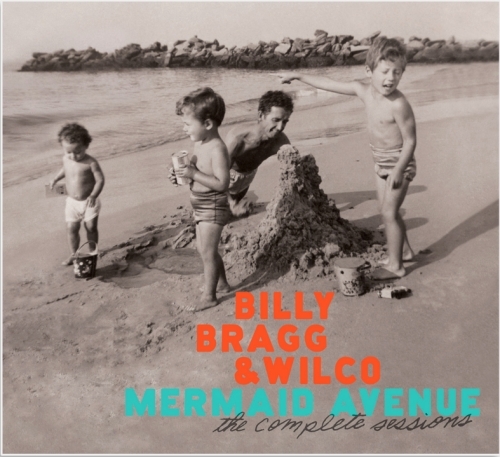 I’ll be queuing myself with the hope of picking up records by Field Music, Guided By Voices, Ryan Adams, the Wedding Present and maybe an early release of the box-set of the Mermaid Avenue Sessions by Billy Bragg and Wilco. As usual I will set myself a strict budget, but in the heat of the moment, with a queue behind, it is easy to get carried away and come home with a handful of unexpected items. The BBC Radiophonic Workshop Dr Who sound effects record is one item that may well make it into my bag, despite the fact that I am unlikely ever to play it more than once. Living in Brighton I am lucky to have aq handful of participating shops to choose from on the day – Rounder, Ape, Endless, One Stop, Borderline and Resident (voted the UK’s best independent record store for the second year running) all on my door step. You can find a list of participating stores near you at http://www.recordstoreday.co.uk/participating-stores.aspx. One thing about Record Store Day does bug me, and that is the way it is used as amoney making exercise by some. In 2010 I just missed out on a copy of ‘Fool’s Day’ by Blur, their much anticipated reunion single. That very same day it was available on Ebay for hugely inflated prices, and not just a couple of copies but dozens and dozens. Each year the same thing happens, sealed copies of hard to get records are sold on Ebay as soon as they fly off the shelves. Don’t play any of the records for Heavens sake. This will sharply diminish their value. Now, this list was intended to be comic, and I don’t want to be too pious, but it does highlight a nasty truth about the day. If it is about a few individuals making a quick profit at the expenses of others, then is that really a celebration of the record shop? Or does it turn something fun and celebratory into a kind of Bargain Hunt with queues? I know people who used to habitually buy up tickets from popular concerts and then sell them on Ebay at a profit when the shows had sold out. You could argue that is just people using their common sense to make some money, or you could argue that it is a nasty reflection on a greedy capitalist society. if you actively reduce the supply, then it isn’t a fair state of supply and demand. The same is true of Record Store Day purchases, the price charged in the stores on the day is a fair reflection of the supply and the demand. If people who have no interest in owning or listening to the records, then buying them just to sell them at a profit denies people who really want them the opportunity to get them at a fair price. The shops restrict purchase to one item per person, but I have seen people come in with friends to get extra copies (and even coordinate other groups of friends at other shops). Even if only a few people try and use the day as a money making experience then it can ruin it for dozens of others, there are only small amounts of many of the records on sale. So, if you want to really celebrate the music and the record stores you love, then go down tomorrow morning and buy yourself some musical treats. And then take them home, rip off the plastic and play them. After all isn’t that what a record is for? The Glastonbury Festival is taking a break in 2012 but central Somerset festival organisers are not resting on their laurels when it comes to making live music available this summer. 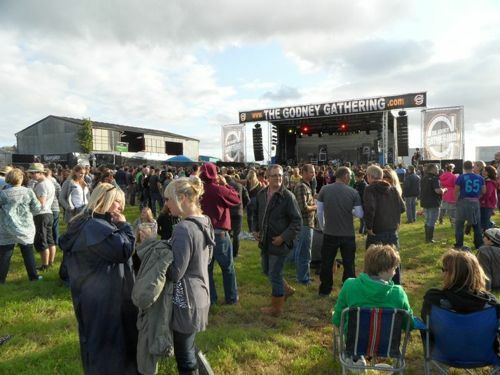 On July 21 the one day Godney Gathering is back for a second year, at Godney Farm near to Glastonbury. Starting at 5pm and finishing at 1am there are five acts for the £20 admission cost. Headlining will be festival rockers Subways, followed by The Hoosiers, whose debut album The Trick of Life topped the UK album charts in October 2007. Others are Reef surf folk side project Stringer Beasant, Manchester indie rock outfit The Rainband, psychedelic rock from Goldray and Glasgow surf band Young Aviators. Organisers have promised a £2.50 limit on all alcoholic drinks sold at the bar. For ticket details and more information click here. This year also sees the first Glastonbury Fringe festival. Taking place between June 21 and July 1 the event involves music, art and theatre at venues across Glastonbury. Highlights include Ben Marwood, Oxygen Thief and Neonfiller.com favourite Nick Parker at Tor Leisure on June 23. 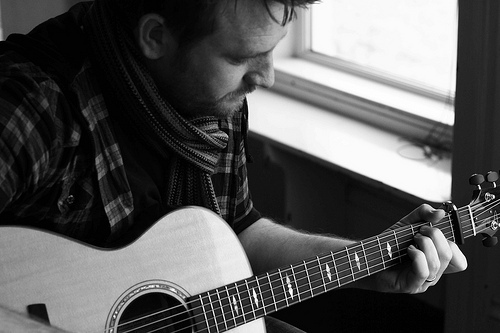 Jim Lockey and the Solumn Sun, Gaz Brookfield and Oleander Brown perform at the same venue on June 22, and a Shamanic Trance Dance Workshop at Glastonbury Assembly Rooms on June 21 also looks intriguing. For more information about Glastonbury Fringe and ticket details click here. Fire Records, the home of alternative music veterans Giant Sand and Mission of Burma, has taken a leaf out of labels such as Slumberland and Fortuna POP! 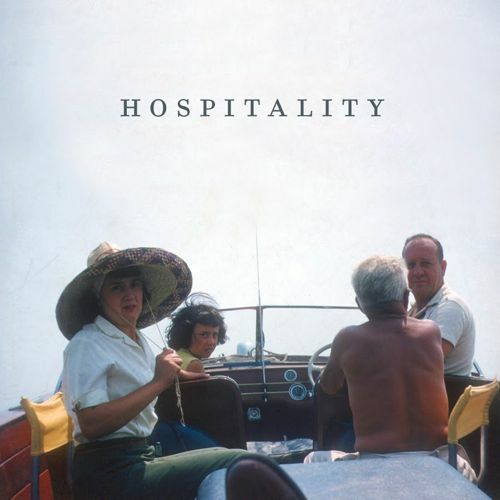 and bagged themselves a beauty of an indie pop act in Hospitality. Central to the success of this Brooklyn trio’s self titled debut album is the singing and songwriting of lead singer Amber Papini. Her turn of phrase, effortless vocals and keenest of ears for a catchy single are only hinted at on opener Eighth Avenue, a kind of Belle and Sebastian rip. But as the album progresses track after track of hook laden, memorable, potential singles follow. Among the highpoints is Betty Wang, about a clean living former colleague of Papin, at a “financial day job”, according to the accompanying press release. It’s a joyous sing-along and one of my favourite tracks of the year. The chorus of another singalong, The Right Profession, is another that stayed with me long after the album had finished. It is not just Papini’s pop savviness that warms me to Hospitality. The arrangements are lifted markedly by some smart saxophone arrangements, most notably on second track Friends of Friends and end track All Day Today. I can’t fault any of the 10 tracks. In fact It sounds like an awful cliché but as the saxophones and jangly guitars drift off on the final track All Day Today I didn’t want this album to finish such is its warmth and sense of fun. Great debut, great find for Fire Records and a surefire contender for our end of year Top 20 album list. Part of me still thinks of Elvis Costello as a bespectacled, angry young man, singing in grainy TV footage in a tight suit, about his aim being true, failing to stand up for falling down and the plight of British industry under Margaret Thatcher. Of course I know he’s not. In reality he’s a portly 57-year-old and one of the music industry’s most prolific artists; dabbling in soul, classical music, country as well as excelling at the UK new wave genre that launched his four decade long career. This latest live album release is testament to what is a stunning track record in music but crucially has a nice twist to it. 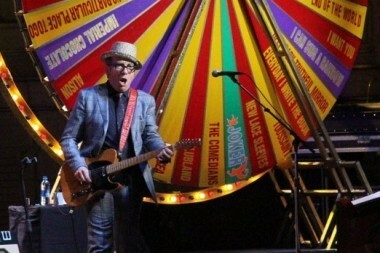 The tracks are chosen by a giant game show spinning wheel, which is spun by fans and was first used by Costello and the Imposters on their Revolver Tour in 1986. For this live album the giant wheel was used over two nights at The Wiltern, Los Angeles in May 2011. When this album was initially released last year, as a limited edition box set featuring all 34 songs played over two nights plus DVD, book and tour poster, it caused a minor stir with an eye popping £176 price tag. Even Costello himself said it was a waste of money. With die-hard Costello fans shunning this mammoth priced album his record label Universal has decided to re-release it in a streamlined CD and DVD pack, featuring 16 tracks on each. Priced at around £13 this is ironically great value considering its preposterously priced initial release. True, it’s a little cheesy at times, but I can’t fail to be bowled over by a giant spinning wheel triggered by a fan and prompting Costello and his band of veterans to ease into their showbiz versions of classics from Alison and Radio Radio to Watching the Detectives. As is so many times said in live album reviews, it will not win over any new fans. But if someone wanted to hear Elvis Costello by now surely they would have done so. For Costello fans it’s a pretty decent package even if some of the versions are little vaudeville at times. I guess though, it’s hard to be anything else with a whacking great spinning wheel behind you.